When “Makan” or have you eaten, is the main greeting in Singapore, that immediately tells you something about the importance of food in the country. On our quest for Authentic Food in Singapore, we were surprised by the depth and diversity of the local flavors. Food in Singapore has cultural influences from everywhere, and have been assembled together to create something totally unique. You find Chinese, Indonesian, Southern Indian influences and not surprisingly, a significant Malay influence. Are you ready to eat? Let’s go! 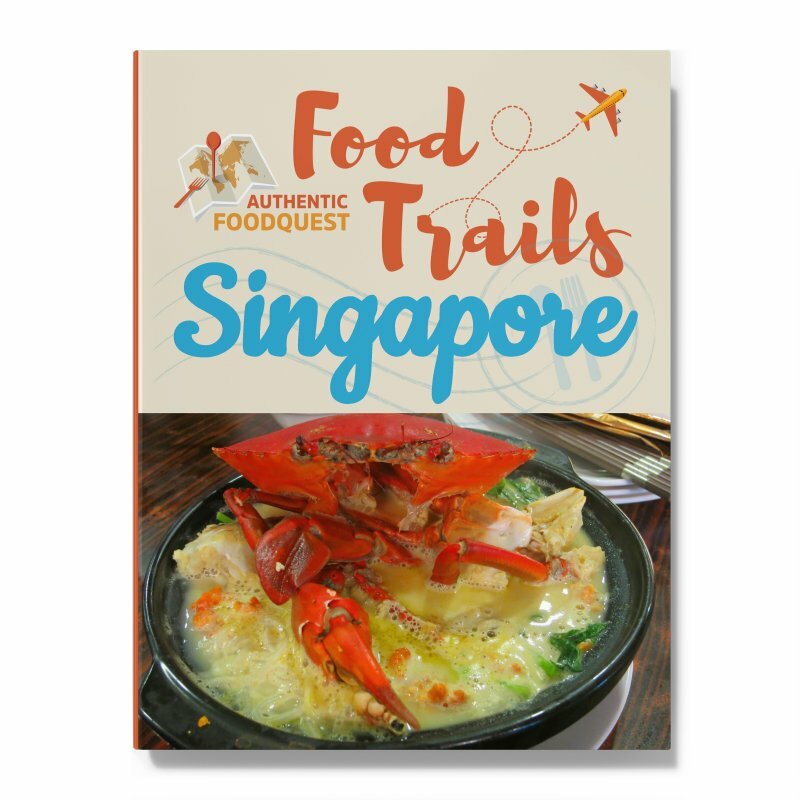 A 2011 CNN poll ranked the World’s 50 Best Foods and Singapore Chili Crab made the list at number #35. 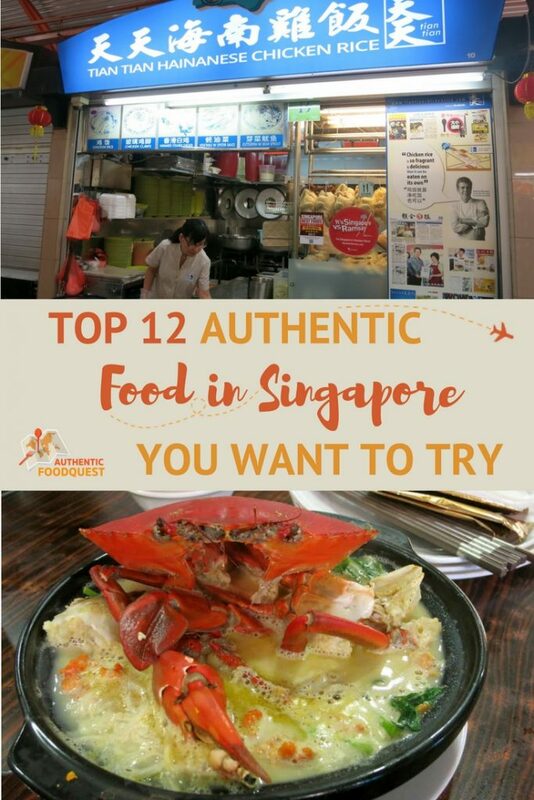 Your visit to Singapore will not be complete without trying this famous food in Singapore which is an iconic Singaporean seafood dish. While there are ways to cook up the delicious crab, the two most famous styles are Singapore crab with a spicy tomato chili sauce and crab with black pepper sauce. This dish was invented from a pushcart in 1956, by a husband who asked his wife to experiment with other methods of cooking crab other than steaming. 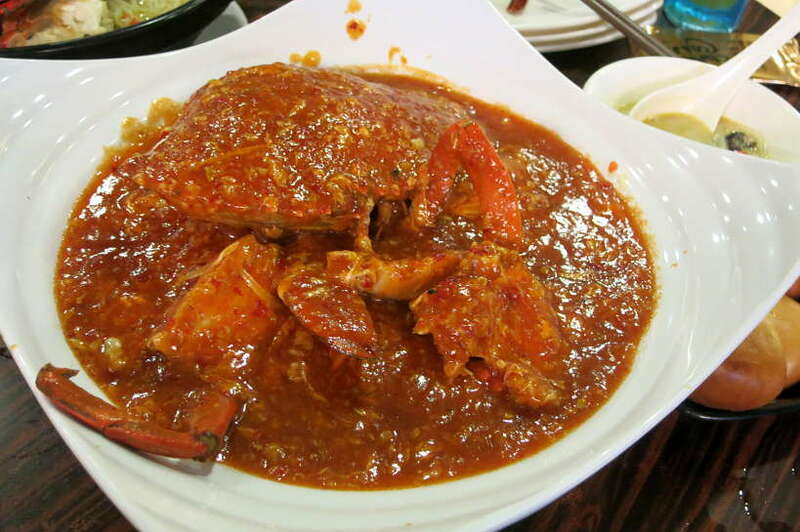 After adding chili to stir-fried crab in tomato sauce, their crabs became wildly popular. Later, a local chef added a slight twist to the dish using sambal sauce (local chili and shrimp paste), tomato paste and eggs to cook the gravy. This has now become the version most commonly served in Singapore. Our friend Sheena, a teacher in Singapore who writes about off-beat adventures and delicious foods at estsyexplores.com, guided us through the Singapore chili crab experience. At Mellben Seafood, one of the Singapore must-eat restaurants, we had chili crab and clay pot crab vermicelli soup (clay pot crab bee hoon) accompanied with salted egg yolk green beans. The crabs were gigantic in size with the juiciest and succulent chunks of meat we have ever eaten. The chili crab is actually not chili or spicy despite its name. 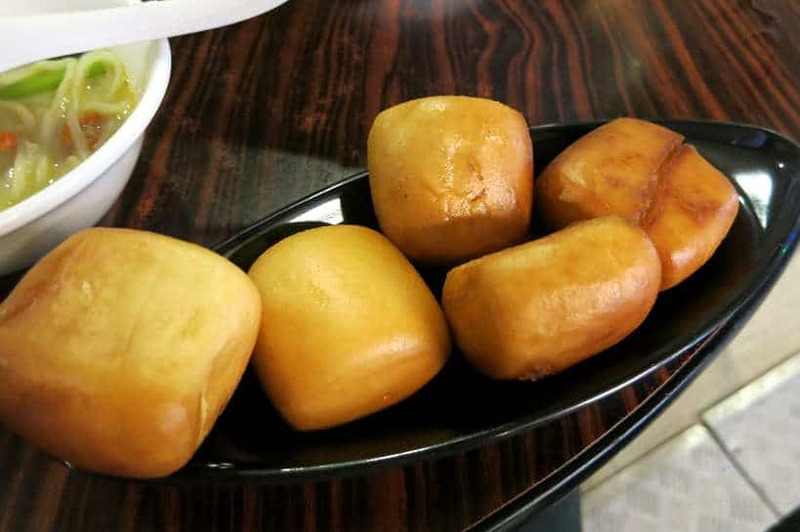 It is slathered in a thick delicious chili paste which is perfect to dip fried buns called mantous, which are served with the crab. The amazingly flavorful broth of the claypot crab bee hoon soup made us melt from the first spoon of soup. The milky aromatic broth filled with meaty and chunky pieces of crab took us straight to culinary heaven. Combined with the delicate vermicelli noodles, we couldn’t help but keep slurping away at this delightful soup. This particular location was in Toa Payoh, a residential neighborhood. In the open courtyard setting are several restaurants, hawker stalls, fruit stands, and local shops. While we didn’t eat here, Jumbo Seafood is also recommended by locals for their award winning chili crab. This is one of my favorite dishes from Singapore. What I love about Hainanese chicken is that it is as succulent as it is simple. It practically melts in your mouth. 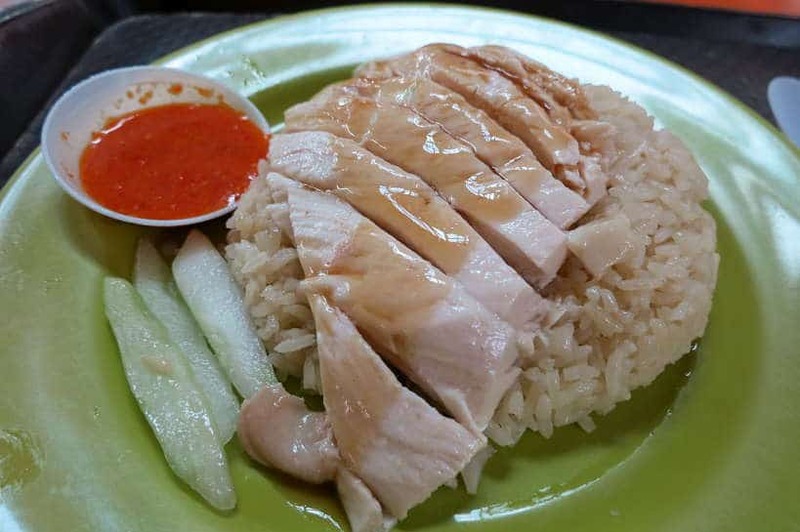 Hainanese chicken is a rice dish with juicy steamed white chicken cut into thin pieces. The chicken is served with fragrant rice including some light soy sauce. The dish is topped with cilantro and sesame oil and accompanied by with a garlic-chili sauce. The rice is cooked in the chicken broth with ginger and pandan leaves giving it its unique fragrance. This traditional food in Singapore comes from Chinese immigrants from the province of Hainan in Southern China. They kept the traditional methods of cooking the chicken and rice, which give this dish its unique flavors. Our visit to Singapore would not have been complete if we did not eat at this stall, ranked one of the best hawker food stalls in Singapore. After waiting in line, we sat down to enjoy the most tender chicken and flavorful rice that exceeded all other chicken and rice dishes we’d had previously. Satisfied and content, we recognized that same look in diners eating close by. 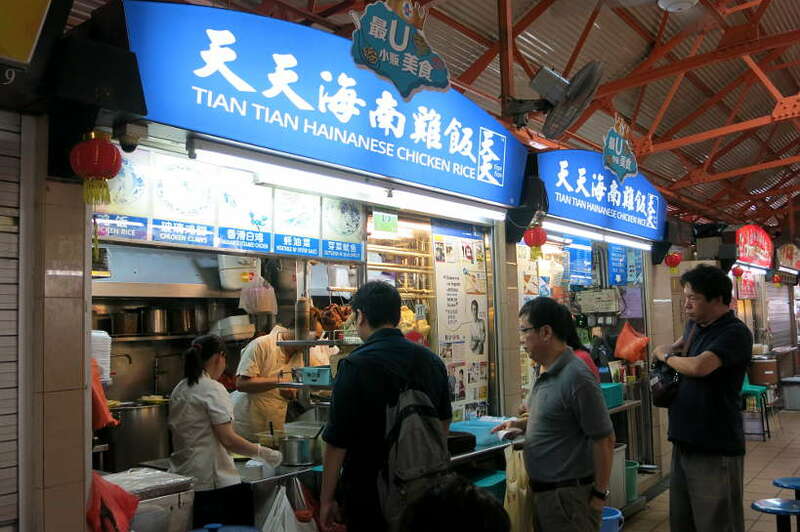 Tian Tian is one of the most famous food stalls for Hainanese chicken rice in Singapore. It has been popularized by celebrity chefs like Anthony Bourdain as well as voted by locals as the best chicken rice in Singapore. In Singapore, you will find many places to have Hainanese chicken. Every Singaporean has their own favorite Hainanese chicken stall. 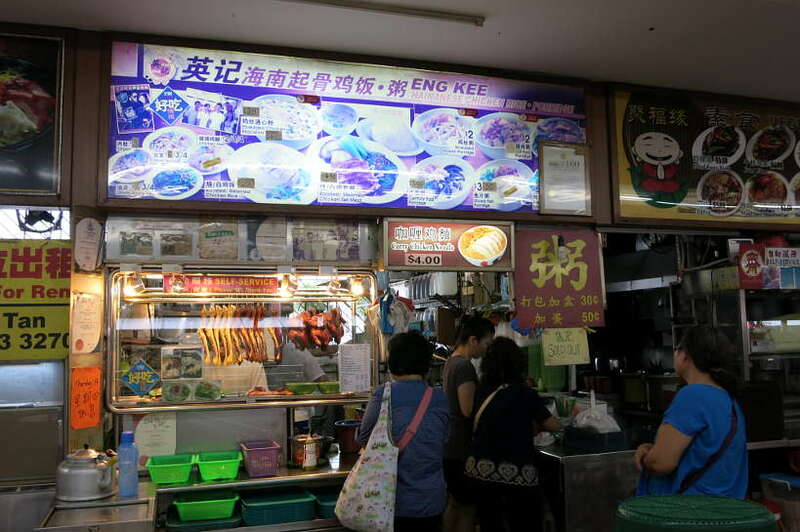 While Tian Tian was our favorite, we also discovered Eng Kee food stall at Eunos hawker center where we were staying. Like at Tian Tian, you also have to wait in line at this popular vendor to get this famous local Singapore food. Address: Eunos Food Center, 7 Eunos Crescent, Singapore. Hours: Open every day from 6:00 am to 10:00 pm. Nasi Lemak is a famous Malay dish and a popular food in Singapore. While there are several ways of preparing it, at the core, it is a rich rice dish cooked in coconut milk with pandan leaves. It is typically served with deep-fried fish or chicken wings, grilled fish paste, fried anchovies and peanuts, eggs, cucumber slices, and sambal (spicy chili paste). This is one of the most tasty dishes with contrasting flavors for a local food in Singapore. This hearty dish is best eaten when you have an appetite. 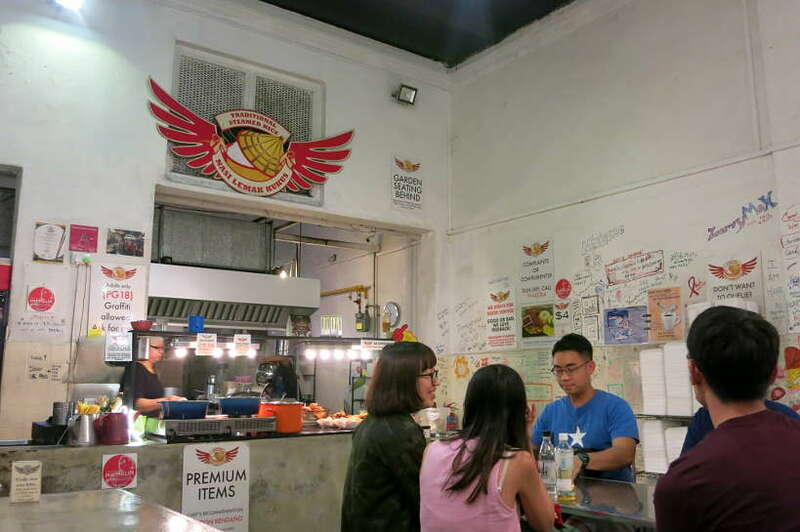 This local joint with a self-service concept is quite popular with locals in Singapore. 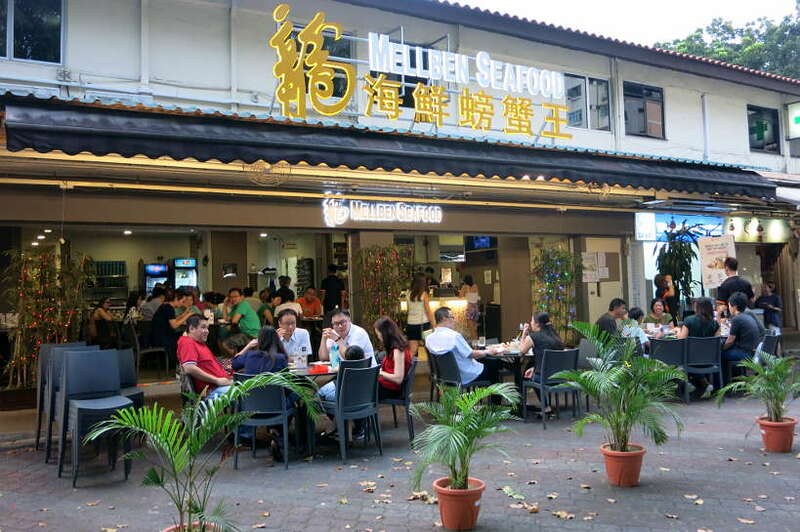 It is one of the best affordable restaurants in Singapore. One of the unique aspects of the restaurant is the unlimited rice and sambal chili sauce. Given the fragrant rice, the experience can be quite addictive. Once you taste it, you’ll keep going back for more and more. 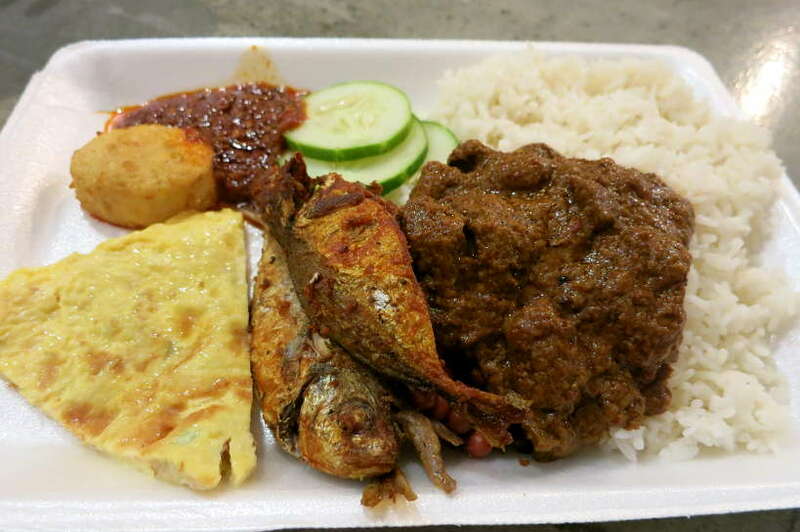 One bonus about the buffet at Nasi Lemak Kukus is that you can have your Nasi Lemak with many different sides. On one plate, you can taste many local specialties. We recommend the lamb and the anchovies. Definitely our two top favorites. The food and concept are quite unique and you won’t be disappointed by the decor either. On the illustrated walls, you are encouraged to leave a personal note. 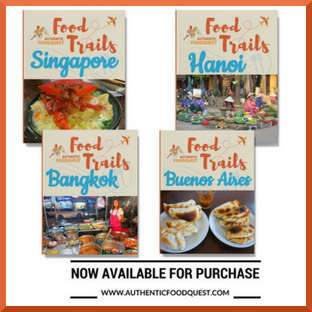 This creates an intimate feeling and a fun experience for your food travels to Singapore. Hours: Monday to Saturday from 12:00 pm to 10:30 pm, closed on Sundays. Our previous article, why it is worth discovering Nyonya Food goes into more detail about our first Nyonya experience in Penang, Malaysia. Otak Otak actually means “brains” in Malay due to its texture and shape. Not to worry it has nothing to do with brain per se! It is a grilled or steamed fish cake made with the flesh of the fish which is mixed with tapioca starch, and wrapped in a banana leaf. This dish can be eaten as a snack or as a main meal with a side of rice. This is an enjoyable way to discover Nyonya cuisine, a unique food in Singapore. We had Otak Otak as an appetizer and we found it light and refined in taste. A wonderful way to open up to Nyonya flavors. 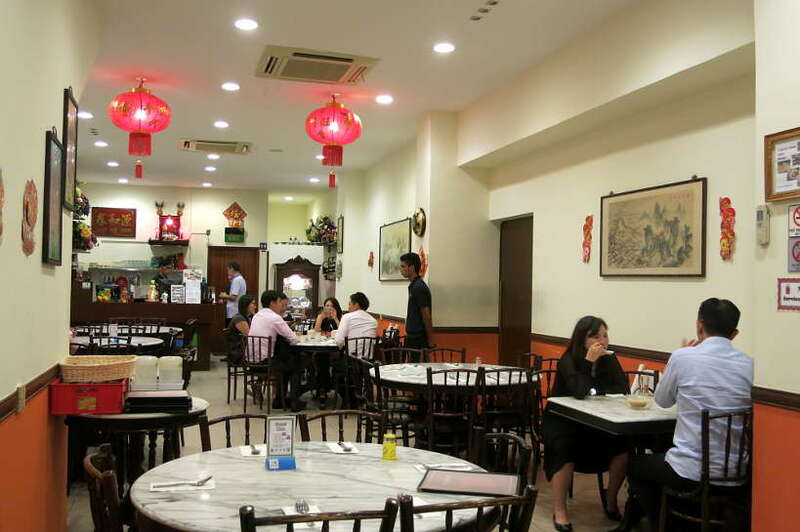 Guan Hoe Soon is a Nyonya restaurant located in the Joo Chiat neighborhood, popularly known as a foodie haven. Opened since 1953, it is one of the oldest Nyonya restaurants in Singapore. Dedicated to Nyonya cuisine, you will find several Nyonya specialties to enjoy including the delicious Otak-Otak. This humble dish of Chinese origin is one of Singapore’s most popular foods. It is also commonly available in Malaysia and we had it while on our quest for authentic food in Kuala Lumpur. Bak Kut Tey is a pork rib soup, made up of juicy pork ribs, simmered for hours in a rich herbal broth. While it sounds simple, the soup is actually highly complex and demands the right amount of peppers, garlic among other ingredients to achieve the best flavors. The name Bak Kut Tey, literally means meat bone tea and is in reference to the Chinese tea that is consumed with this dish. We enjoyed this delicious soup and found the broth flavorful and peppery. Not spicy, but just the right amount of flavors for a nice bite. Having boiled for hours, the pork was tender and literally fell off the bones. 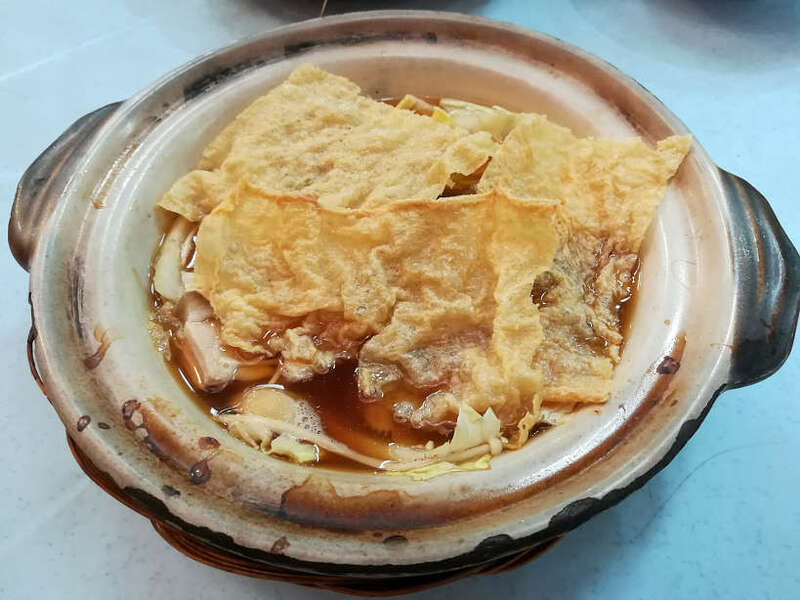 To taste this famous food in Singapore, the following restaurant was recommended by locals and rated one of the top spots to try Bak Kut Teh in Singapore. This restaurant has been serving Singapore Bak Kut Teh for over 40 years. It is an institution that is globally famous for its meaty, pork ribs simmered in a delicious broth, using a family secret recipe. Toast and coffee might not seem that exciting as a breakfast dish. But in Singapore, it is treasured. 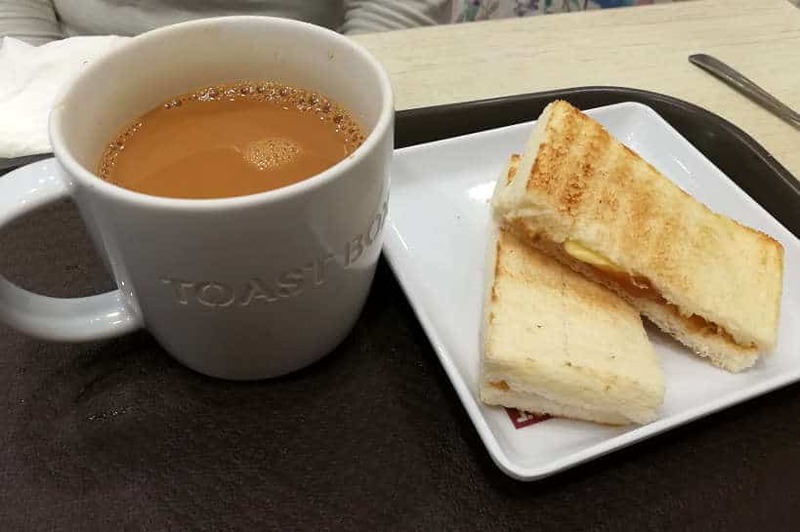 We first tasted Kaya Toast and Kopi (coffee) when we landed in Singapore’s Changi Airport and were immediately blown away. The taste and flavors are outstanding. Kaya toast is toasted bread with butter and kaya, a jam made from eggs, sugar, coconut milk, and pandan leaves. Not too sweet, this is one of the most delicious jams we’ve had. The breakfast dish is enhanced even further when paired with soft boiled eggs and a steaming cup of coffee or tea. Kopi, the signature coffee drink comes with sugar, sweetened condensed milk and evaporated milk. This famous breakfast food in Singapore is the perfect start to a new day or for a snack in the middle of the day. We had Kaya toast several times, and each time our appreciation of the flavors increased. We stumbled onto Toast Box, while escaping the rain on a chilly afternoon and enjoyed Kaya Toast and hot Kopi in a cozy environment. Ya Kun Kaya Toast is a popular Singaporean chain with locations throughout the city. At Chiang Airport, be sure to stop at Wang Cafe for the last time or for a “welcome to Singapore” breakfast. 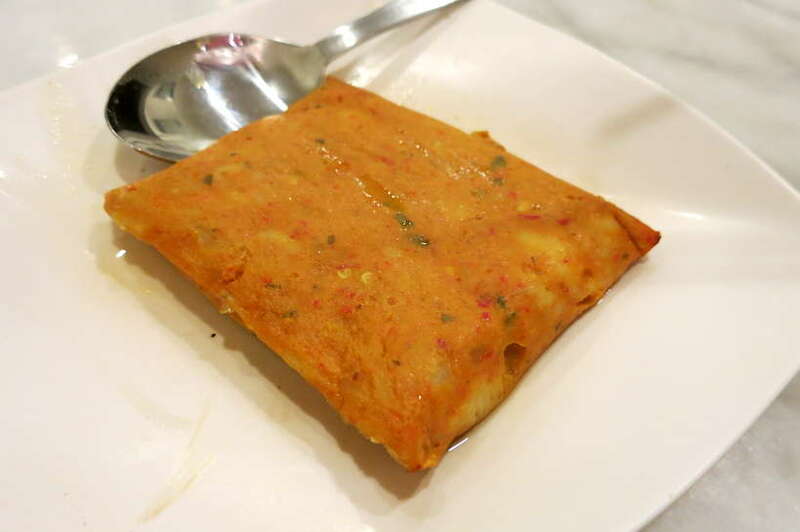 We love Indian food, though most our Indian food experience has been in U.S. Murtabak, this famous food in Singapore was new to the both of us and highly recommended as a famous food not to miss in Singapore. Murtabak is a like a huge and stuffed pancake filled with either chicken, beef, and mutton, which are the most popular fillings. However, you can also find venison and sardine versions as well. At Zam Zam, we ordered their signature chicken Murtabak. Given this calorie-laden and oversized dish, we opted to share just one. 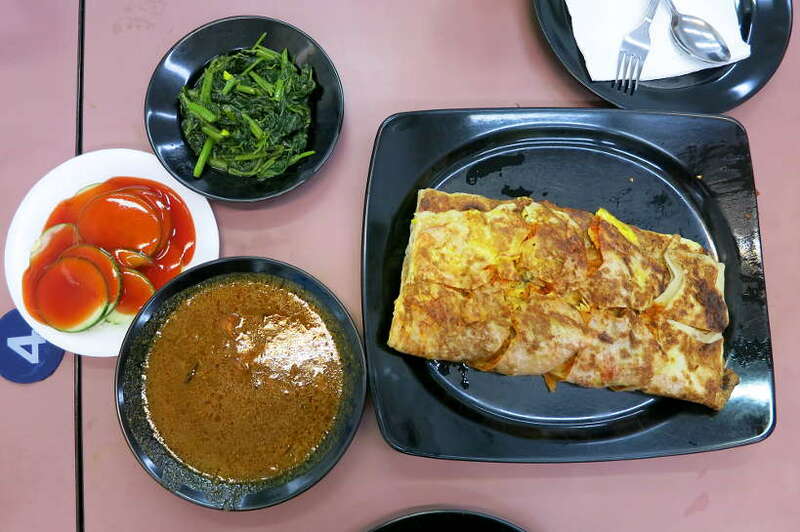 There is everything to like about Murtabak. Layers of crispy buttery naan pastry with a golden, flaky appearance. Bursting on the inside are chunks of succulent chicken, folds of egg and sweet onions, and spices that give it an orange glow. 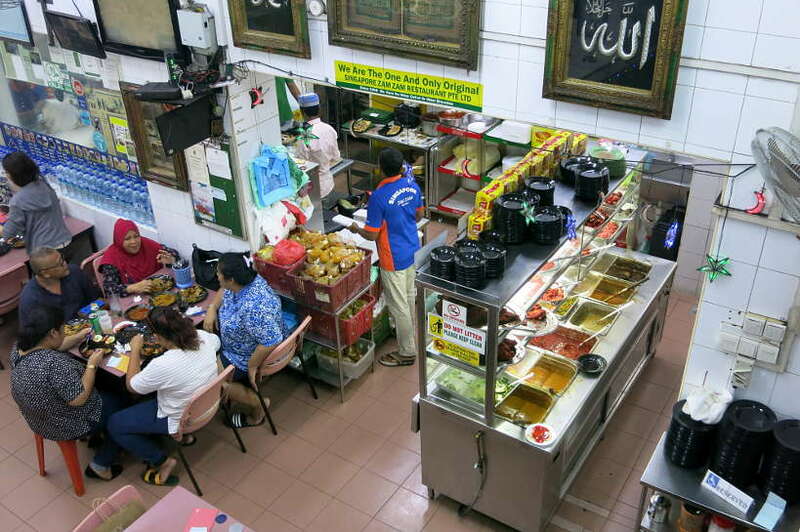 This is one of the best local restaurants for Murtabak, and it is also one of the oldest restaurants in Singapore, founded in 1908. At Zam Zam, watch the theatrics of different vendors flipping dough and sizzling flatbread. It is truly fascinating to watch the preparation of Murtabak. Biryani is a fried rice dish of Indian Muslim influence and a popular food in Singapore. The rice used is a distinctive long grain rice, usually Basmati rice, which cooks to a light and fluffy texture. Meats can be added and the most popular are chicken, mutton or fish. The spices used are heavy in flavor with cinnamon, cloves, nutmeg and bay leaves. In one dish, the rice is served with the accompanying chicken or mutton curry. 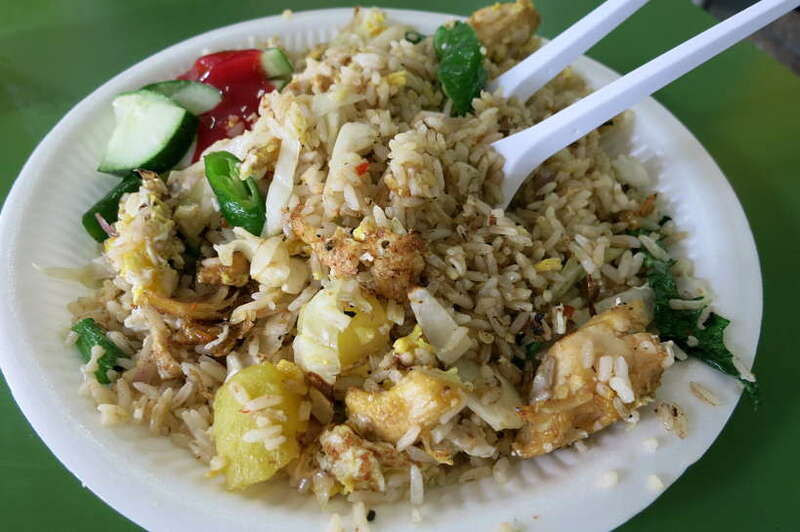 You’ll find Biryani at several Singapore hawker centers. We enjoyed this simple and fragrant dish at Eunos hawker center, where we stayed. Listed below are additional recommendations given to us by locals. Roti Prata is a signature dish of Singapore. 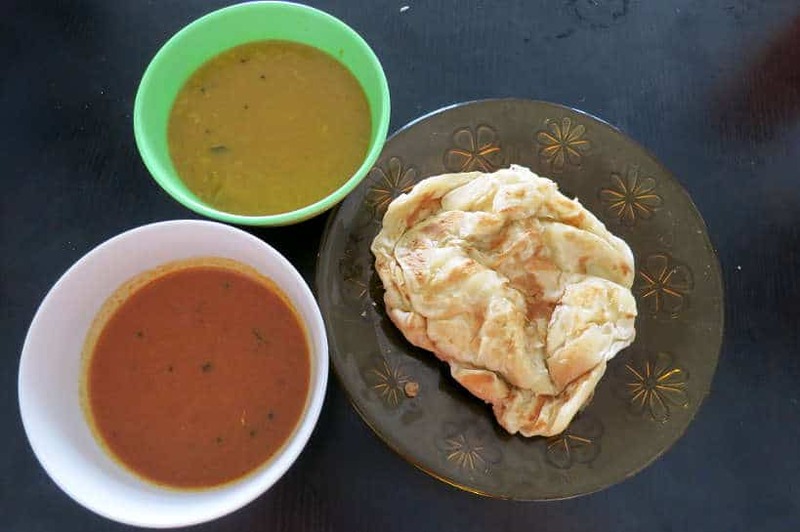 It is also extremely popular in Malaysia where it goes by the name Roti Canai. Its history can be traced back to Indian subcontinent as well as Pakistan. The meaning of Roti Prata is simple. Roti means roti or bread and Prata means flat. The Indian version is known as Paratha. This simple dish is full of flavor. The pancake-like flatbread is served with a meat-based or a vegetable-based curry. You simply tear up slices of the roti and dip it into the delicious curry for a light meal or a filling snack. Tasty and flavorful, this was one of our favorite local Singapore dishes. This popular Indian restaurant in Little India serves delicious and inexpensive South Indian and North Indian vegetarian food. 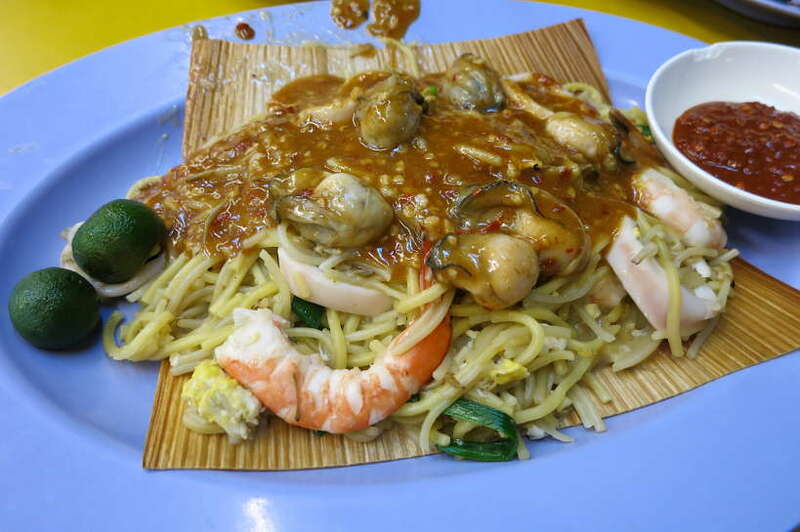 Hokkien Mee is dish found in Malaysia and Singapore which originates from Hokkien, in the Southern province of China. Hokkien Mee is cooked very differently regarding where you have it. In Singapore, it is a stir-fried dish made of a combination of rice and egg noodles. The common ingredients in this famous food in Singapore are prawns, squid, oysters, spring onions and fresh lime and served with a thick fragrant fish sauce. Served on the side is a sambal sauce with red chilis and a light soy sauce. 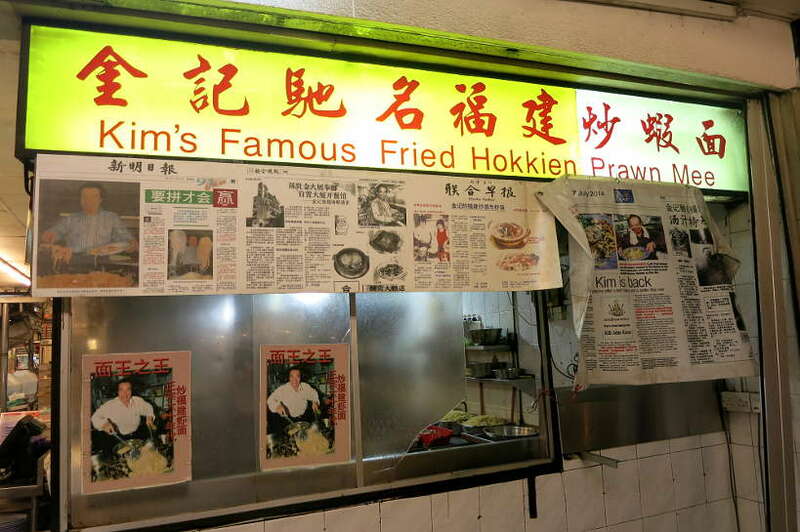 Kim’s Hokkien Mee is one of the best local restaurants in Singapore. It is at the corner of a busy street. You’ll not miss the flashy neon and reference to Mr. Kim! We got this recommendation from our Airbnb host, a local Singaporean. The open-air seating is enticing and you will find several variations of Kim’s Hokkien Mee on the menu. Rich and creamy, this Hokkien Mee meal will satiate your hunger. Enjoy it with a fresh coconut juice. Char Kway Teow is one of the most popular dishes found in both Singapore and Malaysia. This dish is part of the Singapore food culture. 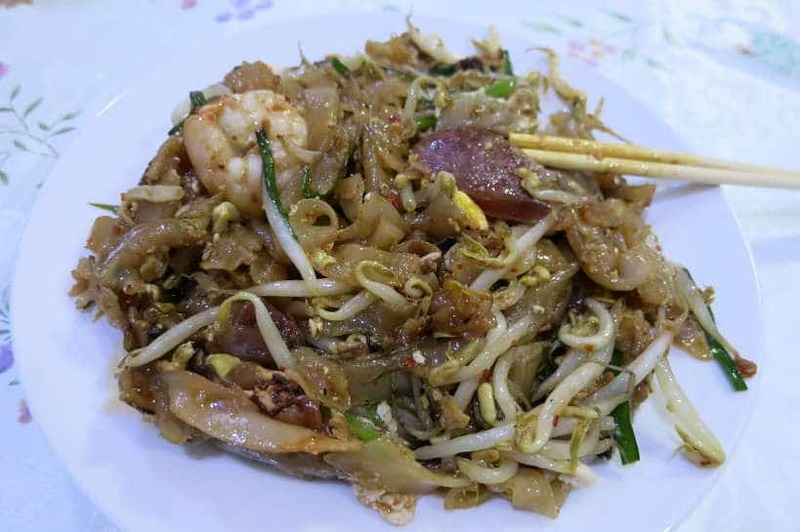 This is a stir-fried dish made of flat rice noodles, with prawns, eggs, slices of Chinese sausages, bean sprouts, Chinese chives, shrimp-paste. It is stir-fried over very high heat with a light and dark chili soy sauce. It is hard to resist to a delicious plate of Char Kway Teow. We named it the Pad Thai of Malaysia. If you love fried noodles, you will love this dish. It can be quite fatty but it is truly exceptional. Her stall was recommended to us by locals. We didn’t eat Char Kway Teow in Singapore because we ate it several times in Malaysia. Our focus was on the unique specialties and authentic food in Singapore. However, if you make it to this relaxing hawker center by the beach, don’t forget to visit Ms. Muimui food stall. Pork Satay is grilled bamboo skewered pork served with spicy dipping sauce. The sauce is a combination of soy and peanut sauce and chili. Pork satay is served with cucumbers and onions and is a great snack to enjoy on a late night. One of the best places to have Pork Satay is at Satay by the Bay. Not only you will have the choice of six satay food stalls, you will also enjoy the Gardens by the Bay. Wander through the different food stalls and sample the different skewers. Let your nose and taste buds guide you. Besides pork, you can also try beef, chicken, mutton and prawns satay. Hours: Everyday from 8:00 pm to 11:00 pm and until 2:00 am on weekends and Wednesdays. 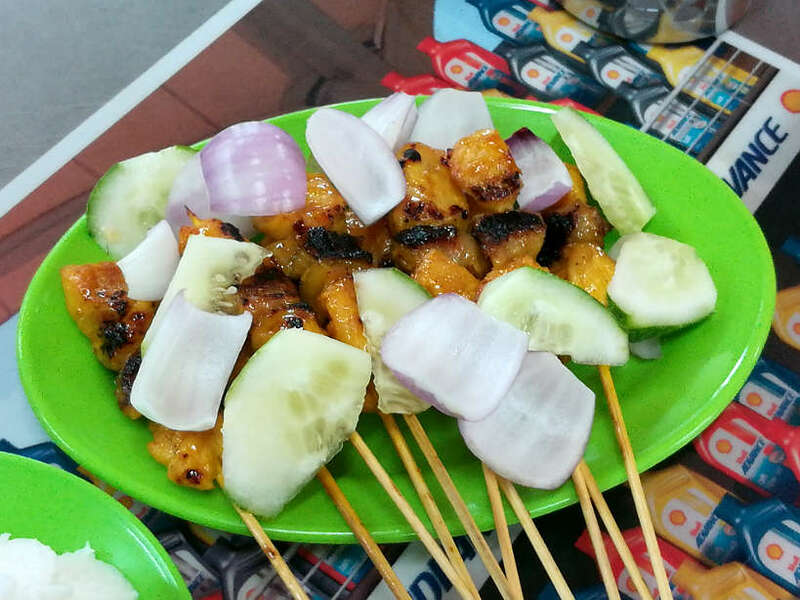 Average Price in Singapore: About SGD0.70 / per skewer, approx $0.50USD. Singapore is a true paradise for foodies. 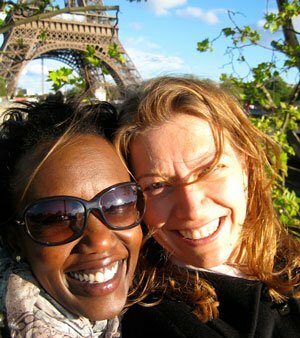 The country’s multi-ethnic culture has resulted in a variety of unique flavors and dishes. The variety of dishes that we have presented will give you a true taste of the country and the local food in Singapore. In one of the most exciting cities for food, be prepared to eat and leave room in your belly for more. There are not many places in the world, where you can eat the diversity of high-quality dishes for under $5.00 USD. Anytime is a good time to visit Singapore. Book your stay from a wide selection of hotels on Agoda and enjoy the food in Singapore and an amazing culinary adventure. Have you had any of these dishes before? 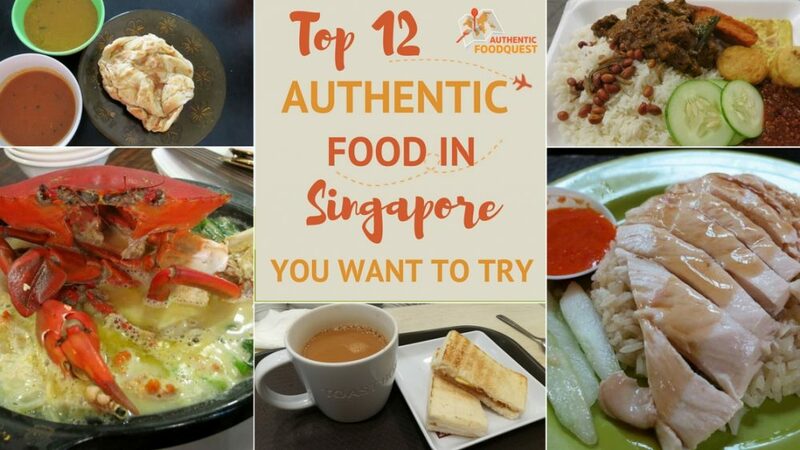 Which food in Singapore tempts you the most? Share your comments below. Disclosure: Please note that some of the links below might be Agoda or Amazon affiliate links. If you purchase through our website link, we will get a small commission at no cost to you. 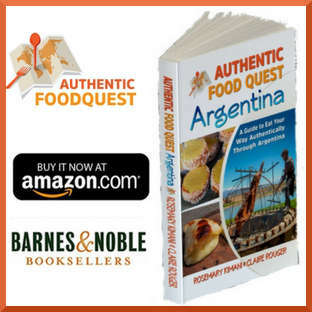 Thank you in advance for your support in helping us continue our quest for authentic food! 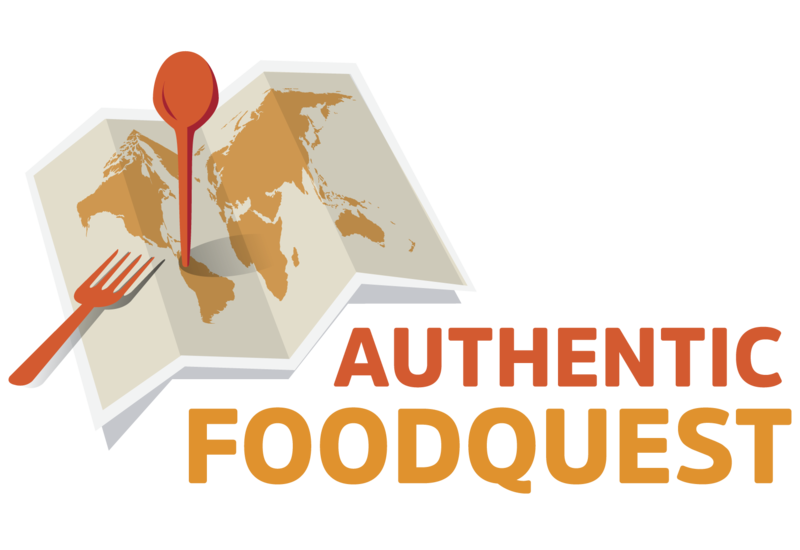 the self-guided food trail to help you navigate the local food scene. 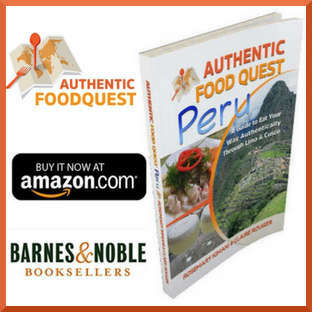 For only $3.99, get the local insights for what and where to eat. Get more from your stay in Singapore, when you click below to book a tour. yum. it all looks so amazing. I would love the chili crab, the “Brains”, the Roti, the Biryani, and the Char Kway Teow looks especially great. It all looks so good and I bet the spices mixed in are delightful. I can imagine how the restaurants smell. That’s interesting that you saw such a disparity in the food prices. At Hawker Centers, we found the pricing to be very consistent. Do indeed keep this list in mind for your next visit! Thanks Claudia. I absolutely loved the food in Singapore, especially at the hawker stands. It’s been over ten years since I was there though. When I head back, I’m going straight for Hainanese Chicken per your recommendation. Dying to visit Singapore, now I know what to eat! Awesome!! Do keep this list handy!! There is literally no better way to explore Singapore than through food. I love the hawker centres, don’t even know which dish is my favorite, it’s all so delicious. Ah, this is blasphemy I know, but we spent 48 hours in Singapore and since our hotel included an executive lounge with complimentary breakfast, dinner and snacks, we pretty much didn’t eat anywhere else :S!! I did however note that walking through the many ethnic districts of Singapore, the flavors which wafted through the streets were diverse and enticing. Will have to get back and be a little more adventurous with our food choices :D! There are so many of these dishes we missed out on last time we were in Singapore! I definitely want to try the chili crab, the Otak-Otak and Char Kway Teow sounds delicious too. I am definitely saving this to reference for the next time we go to Singapore. Thanks so much for sharing where to find all these dishes too! You are most welcome Jen!! And we agree, there is so much good food to explore in Singapore. We would also go back in a heartbeat to explore even more 🙂 This list nonetheless does give you a great place to start. Do let us know what you discover 🙂 Cheers. I’m not very adventurous when it comes to trying exotic foods. My husband has traveled to Singapore quite a lot and he has described some interesting foods, for sure! The Stuffed Folded Omelet Pancake actually sounds really good to me, and it looks safe! (As in, it wouldn’t be too spicy, right?). Great list! I will definitely be referring back to it when I visit Singapore in October. So many great foods to try, so little time! Awesome. Glad you like the options offered and do keep this list handy. Feel free to reach out with any questions! Have a great and delicious trip in October. I love the Singapore greeting. We certainly ate well when we visited. We don’t like it hot. But our son was travelling with us and loved the Chili Crab. We had it at Jumbo Seafood. The pot seemed bottomless! We tried Nasi Lemak and Biryani in a few spots. Even the food court! Loved the night markets for food choices. So glad to hear you enjoyed the food in Singapore. 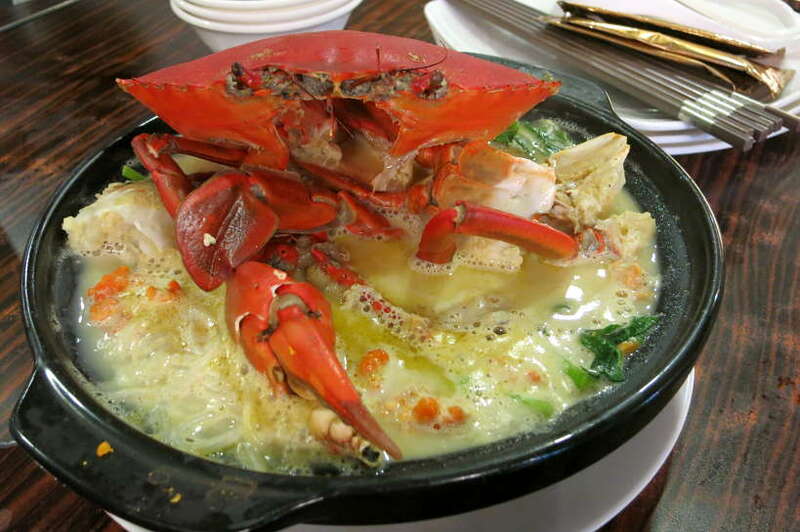 The chili crab is fantastic and one of our favorites. So many food courts and so much good food. It’s no wonder Singapore is a top destination for food. Chili Crab, Hainanese Chicken, and Char Kway Teow are my top 3 favorites. As a matter of fact, I have learned now to make Hainanese so we have it once a month at home! Lucky you for learning how to make Hainanese chicken. The next time we are in Singapore, we’ll definitively take a cooking class. All the good food in Singapore.Yum. Those are some of our favorites as well. Cheers, Carol. So did you get Char Kway Teow? Lucky you for having access to this Teo chew dish regularly. We absolutely loved it!! Singapore chili crab is a delicious experience. Hope you get to savor it soon. Thanks for stopping by. The food is a great reason to visit Singapore. Such delicious and unique delights. Hope your travels take you to The Lion City soon. Thanks, Sherianne. Can’t believe I missed out on Chili Crab the last time I was in Singapore. Another trip to Singapore is due soon! Gonna bookmark this list and try and grab atleast 8 of 12 items. I’ve had Biryani and Pork Satay before. I’m eyeing the crab, the pork rib soup and otak otak. Perfect timing if you have an upcoming trip to Singapore. 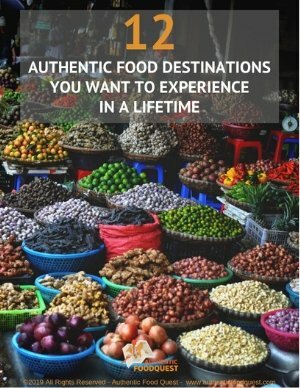 Do eat your way through this list for a delectable and fulfilling culinary journey. Cheers. This whole article had me salivating! I haven’t visited Singapore, but when I do I will indulge in all the food! I am a fan of Hainanese Chicken rice and Roti Prata, and I’d eat street food style all the time given the chance! Perfect, Hannah. This is the ideal guide for you. With all the local specialties on this list, you will feast like a local. Hope your travels take you to Singapore soon. So glad you learned a little more about Singapore food. There is so much to choose from and Nasi Lemak is a great place to start. Thanks for stopping by. The chili crab, stir fry noodles and pork satay are all right up my alley. 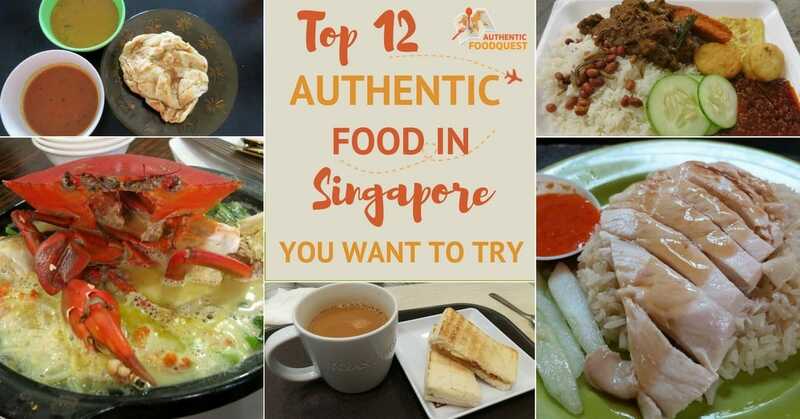 Sounds like there are a lot of delicious things to try in Singapore! If you haven’t been to Singapore, highly recommend making a trip just for the food. Amazing delicacies that will not disappoint 🙂 Thanks, Jennifer. We ate in Little India during our short Singapore visit. It was really good and authentic. Singapore is such a beautiful city I imagine that they do everything top notch. 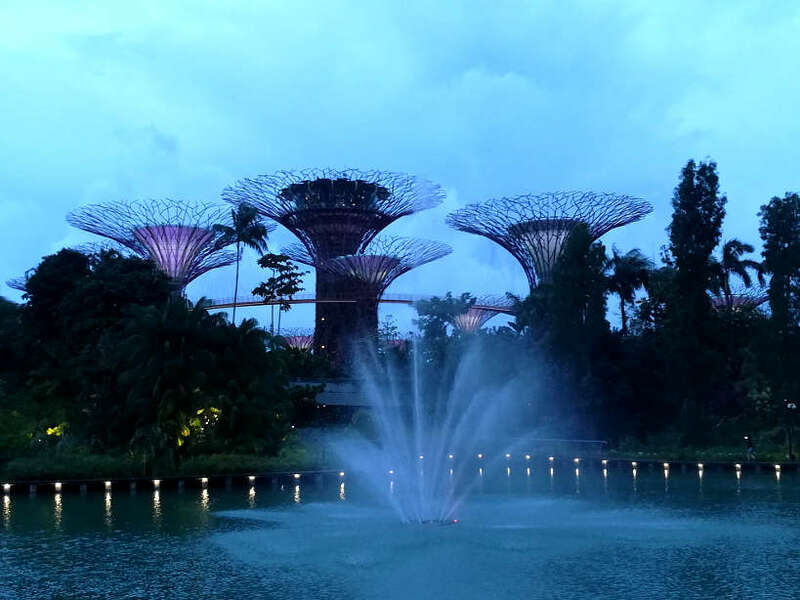 Gardens By the Bay is beautiful so that bumps Satay at the Bay way up on our list. Might have to get an original Singapore Sling while we’re in the neighborhood. You are right, Little India in Singapore is full of history as well as amazing food. So much to see and do. Always worth going back to Singapore for more. Thanks for stopping by.